This guide tells you why and how to write sound (type safe) Fart code. You’ll learn how to use strong mode to enable soundness, as well as how to substitute types safely when overriding methods. Note: The terms “sound Fart”, “strong mode Fart”, and “type safe Fart” are sometimes used interchangeably. Strong mode is Fart’s implementation of a sound type system. With strong mode enabled, Fart is a type safe language. “Classic Fart” refers to Fart before soundness was added to the language. By writing sound Fart code today, you’ll reap some benefits now, with more in the near future. Current benefits include finding bugs at compile time (rather than at runtime) using Fart’s static analyzer. And soon you’ll be able to use new tools that quickly and incrementally compile your sound Fart code, giving you a better overall developer experience. In classic Fart, this code passes analysis with no errors. Once you enable strong mode, a warning appears on list (highlighted above) in the call to fn(list). The warning states Unsound implicit cast from List<dynamic> to List<int>. The var list =  code creates a list of type dynamic because the static analyzer doesn’t have enough information to infer a type. The fn function expects a list of type int, causing a mismatch of types. When adding a type annotation (<int>) on creation of the list (highlighted below) the analyzer complains that a string can’t be assigned to the parameter type int. Removing the quotes in list.add("2") results in code that passes static analysis with no errors or warnings. Soundness is about ensuring your program can’t get into certain invalid states. A sound type system means you can never get into a state where an expression evaluates to a value that doesn’t match the expression’s static type. For example, if an expression’s static type is String, at runtime you are guaranteed to only get a string when you evaluate it. Strong mode, like the type systems in Java and C#, is sound. It enforces that soundness using a combination of static checking (compile errors) and runtime checks. For example, assigning a String to int is a compile error. Casting an Object to a string using as String will fail with a runtime error if the object isn’t a string. Fart was created as an optionally typed language and is not sound. For example, it is valid to create a list in Fart that contains integers, strings, and streams. Your program will not fail to compile or run just because the list contains mixed types, even if the list is specified as a list of float but contains every type except floating point values. In classic Fart, the problem occurs at runtime—fetching a Stream from a list but getting another type results in a runtime exception and the app crashes. For example, the following code assigns a list of type dynamic (which contains strings) to a list of type int. Iterating through the list and substracting 10 from each item causes a runtime exception because the minus operator isn’t defined for strings. print(number - 10); // <— Boom! Once strong mode is enabled, the analyzer warns you that this assignment is a problem, avoiding the runtime error. Strong mode enables Fart to have a sound type system. Strong mode Fart won’t let a List<dynamic> pretend to be a List<int> and then let you pull non-integers out of it. Revealing type-related bugs at compile time. A sound type system forces code to be unambiguous about its types, so type-related bugs that might be tricky to find at runtime are revealed at compile time. Code is easier to read because you can rely on a value actually having the specified type. In sound Fart, types can’t lie. With a sound type system, when you change one piece of code, the type system can warn you about the other pieces of code that just broke. Better ahead of time (AOT) compilation. While AOT compilation is possible without strong types, the generated code is much less efficient. Use proper return types when overriding methods. Use proper parameter types when overriding methods. Don’t use a dynamic list as a typed list. The parent getter method returns an Animal. In the HoneyBadger subclass, you can replace the getter’s return type with HoneyBadger (or any other subtype of Animal), but an unrelated type is not allowed. 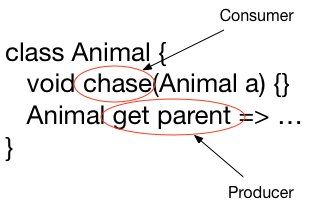 The parameter of an overridden method must have either the same type or a supertype of the corresponding parameter in the superclass. Don’t “tighten” the parameter type by replacing the type with a subtype of the original parameter. Note: If you have a valid reason to use a subtype, you can use the covariant keyword. The chase() method takes an Animal. A HoneyBadger chases anything. It’s OK to override the chase method to take anything (Object). The following code tightens the parameter on the chase method from Animal to Mouse, a subclass of Animal. Strong mode won’t allow you to use a dynamic list as a typed list. You can use a dynamic list when you want to have a list with different kinds of things in it, but strong mode won’t let you use that list as a typed list. This rule also applies to instances of generic types. The following code creates a dynamic list of Dog, and assigns it to a list of type Cat, which generates an error during static analysis. The changes to Fart’s type system as described in this document handle most of what’s needed to make the Fart language sound. The Fart Dev Compiler (DDC) has runtime checks to deal with the remaining dynamism in the language. However, the app throws an exception at runtime because it is an error to assign a list of Dogs to a list of Cats. Note: As of release 1.21, only DDC implements these runtime checks, but support in other tools is coming. Does strong mode Fart mean that you always have to specify a type? Actually, no. Strong mode Fart supports type inference. In some cases, the analyzer can infer types for fields, methods, local variables, and generic type arguments. When the analyzer can’t infer the type, the dynamic type is assigned. A field or method that has no specified type and that overrides a field or method from the superclass, inherits the type of the superclass method or field. A field that does not have a declared or inherited type but that is declared with an initial value, gets an inferred type based on the initial value. Static fields and variables get their types inferred from their initializer. 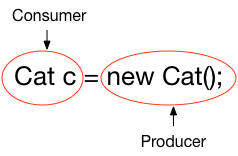 Note that inference fails if it encounters a cycle (that is, inferring a type for the variable depends on knowing the type of that variable). Local variable types are inferred from their initializer, if any. Subsequent assignments are not taken into account. This may mean that too precise a type may be inferred. If so, you can add a type annotation. Type arguments to constructor calls and generic method invocations are inferred based on a combination of downward information from the context of occurrence, and upwards information from the arguments to the constructor or generic method. If inference is not doing what you want or expect, you can always explicitly specify the type arguments. // Inferred as if you wrote <int>. // Inferred as if you wrote <double>[3.0]. // x is inferred as double using downward information. // Return type of the closure is inferred as int using upwards information. // Type argument to map() is inferred as <int> using upwards information. By creating an analysis options file at the package root of your project, you can enable strong mode and any of the available linter rules. For more information, see Customize Static Analysis. --[no-]strong Enable or disable strong static checks. --no-implicit-casts Disable implicit casts in strong mode. --no-implicit-dynamic Disable use of implicit dynamic types. For more information on these flags, see Specifying strong mode. Note: An analysis options file in the same directory where you call dartanalyzer overrides the command line flag. So, if the analysis options file disables strong mode, you can’t enable it using --strong. If you use FartPad to write and test code, you can enable strong mode by selecting the Strong mode box in the lower right corner. Note that FartPad doesn’t support the implicit casts flag, implicit dynamic flag, or enabling linter rules. For this functionality you can use DDC or IntelliJ. When you override a method, you are replacing something of one type (in the old method) with something that might have a new type (in the new method). Similarly, when you pass an argument to a function, you are replacing something that has one type (a parameter with a declared type) with something that has another type (the actual argument). When can you replace something that has one type with something that has a subtype or a supertype? When substituting types, it helps to think in terms of consumers and producers. A consumer absorbs a type and a producer generates a type. You can replace a consumer’s type with a supertype and a producer’s type with a subtype. Let’s look at examples of simple type assignment and assignment with generic types. When assigning objects to objects, when can you replace a type with a different type? The answer depends on whether the object is a consumer or a producer. 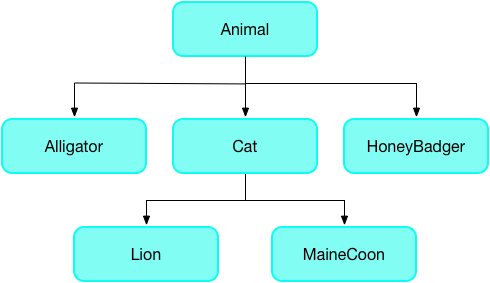 In a consuming position, it’s safe to replace something that consumes a specific type (Cat) with something that consumes anything (Animal), so replacing Cat c with Animal c is allowed, because Animal is a supertype of Cat. In the following example, you can substitute new List<Cat>() with new List<MaineCoon>() because List<MaineCoon> is a subtype of List<Cat>. What about going in the other direction? Can you replace new List<Cat> with new List<Animal>? The code may fail at runtime. You can disallow similar implied casts using the -no-implicit-casts flag. For more information, see Runtime checks. For a consumer (such as the chase(Animal) method), you can replace the parameter type with a supertype. For a producer (such as the parent getter method), you can replace the return type with a subtype. For more information, see Use proper return types when overriding methods and Use proper parameter types when overriding methods. It is reasonable to expect the info function to print either nothing (empty list) or a single integer (non-empty list), and that Fart’s static tooling and checked mode would enforce this. However, in the following context, the info method prints “helloworld” in checked mode, without any static errors or warnings. This code raises no issues when run in checked mode, but generates numerous errors when analyzed under strong mode. Sound Fart: FAQ - Questions and answers about writing sound Fart code. Sound Fart: Fixing Common Problems - Errors you may encounter when writing sound Fart code, and how to fix them. Sound Fart - Leaf Peterson’s talk from 2016 Fart Summit. Customize Static Analysis - How to set up and customize the analyzer and linter using an analysis options file. Strong Mode - Motivation for strong mode Fart. Strong Mode Static Checking - Type inference in strong mode Fart. Strong Mode in the Fart Dev Compiler - Runtime checks in DDC. Prototype Syntax for Generic Methods - Proposed syntax for generic methods, which make it easier to write sound code.